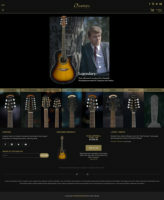 Ovation Guitars has launched what it describes as version 2.0 of its website – www.ovationguitars.com. The new site, which covers all Ovation guitars and Adamas strings is packed with new features and much improved navigation, the company says. ‘Ovation fans can now search by product type allowing them to find complete instrument information with ease. Every guitar, bass and mandolin has its own page, which includes the latest technical specifications, detailed product description, color swatches and images from multiple angles. Many of the instrument pages also include case recommendations. ‘Visitors can see the latest news by visiting the updated artist page, signing up for the Ovation newsletter, discovering dealer locations and more. Video content will be added on a regular basis and the brand invites enthusiasts to post their own Ovation content to win swag and other accessories to be picked at random’. The post Ovation launches major new website appeared first on Music Instrument News.